It is not uncommon to have CAD files (such as Autocad or Microstation) whose elements have embedded keys to an external database (such as an Access file or even Oracle). While these systems are not traditional GIS systems, the data can be combined with FME to appear like GIS features when viewing them in GTViewer. When I say appears like GIS features, I mean that if you review the graphic representation of a feature, you will get one or more tabular records related to that feature, and you can locate on a feature based on its associated tabular attributes. 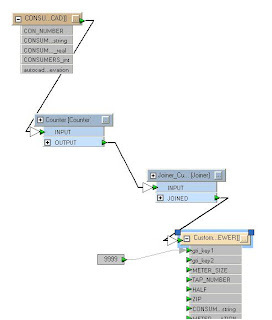 Using FME and the GTViewer plug-in, you can take CAD files and a database and pretty easily make a GIS-like dataset for GTViewer. In this posting, I am going to take an Autocad file (.dwg) and an Access File (.mdb) with two tables. 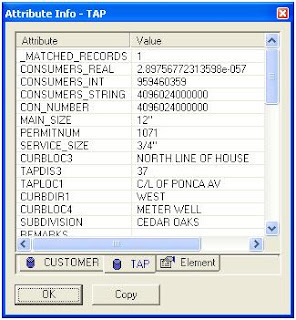 To make this task a little more interesting, the feature in the CAD file is a customer location with an embedded customer number (as a string value) and the Access file has two tables (Customer and Tap) where one record out of each table will be associated with each graphic. Fortunately, FME provides the Joiner transformer to do all of the hard work. If we only had one table to join to the graphic feature, the task is trivial, so I will begin by using a Joiner to add one of the records to the geometry and create a new GTViewer destination feature called Customer. This simple configuration will do all that is required for joining one record into the graphics. But in our case, we have records from two different tables that need to be associated with the geometry and the configuration is a little more complicated. First, we need to add a Counter transformer to generate a unique key that we can be use for the geometry and the two records. This key links the geometry to the tabular data and vice versa. The count output attribute can be named gti_key2 and will be one part of the key used by GTViewer. The count should start at 1 too, since 0 is not a valid key in GTViewer. Now comes the fun part. We add a second Joiner (called Joiner_Tap) and specify the Tap table in our .mdb file. We then set the key from the autocad feature (Con_Number) and a key from the tap table (AccountNum). Our newly created Tap output feature needs to have three format attributes exposed: gti_key1, gti_key2, and gti_type. The key attributes are the same as in our first feature. The gti_type needs to be set to gti_data because we don’t want another graphic generated for the feature, just the tabular record. We then copy the attributes from the Joiner_Tap transformer, and voila! Version 7.0.x.14 of GTViewer is available. - FIX - Upgraded ECW Library to version 3.3.0.185 to correct a color depth problem encountered when printing. Version 7.0.x.6 of GTVx is available. - CHG - Max UDLS defintions increased to 1000. - CHG - Max Filter Definitions increased to 2500. Version 7.0.x.12 of GTViewer is available. - NEW - Additional Logging for GPS points has been added when Logging is on Maximum. - NEW - External Application Mode 2 has been added to provide single instance non-modal external applications. - FIX - NMEA GPS sentence validations relaxed for devices like the Panasonic Toughbook that does not provide certain information in the NMEA sentences (such as Time). Version 7.0.x.5 of GTVx is available. - NEW - OriginOffsetX and OriginOffsetY have been implemented for TrueType Text Element symbols. - NEW - Upgraded ECW Library to version 3.3 and added support for .JP2 and .ERS files. - FIX - Additional Properties were not being between session and could duplicate cumulative item entries like RasterPC. - NEW - Magnify Window can not be dynamically sized and moved. - NEW - Magnify Window can now be position at any location (instead of just 0,0). - FIX - Magnify Window was not updating correctly if the height and width were not equal.